The $1 note. The blue colour I thought was much lighter than the previous currency notes. Other than the portrait of His Majesty and the new see-through, the bunga simpur, the national flower, has increased in size. The reverse has obviously changed from a scene from the forest to a scene of Bandar Seri Begawan, the Brunei capital. 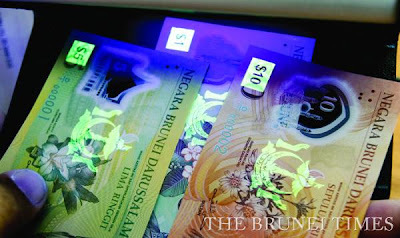 The $5 note lost the pitcher plant and that was replaced by a Bunga Kunyit. The reverse too is now the picture of the Lapau, Brunei's former Legislative Assembly building. 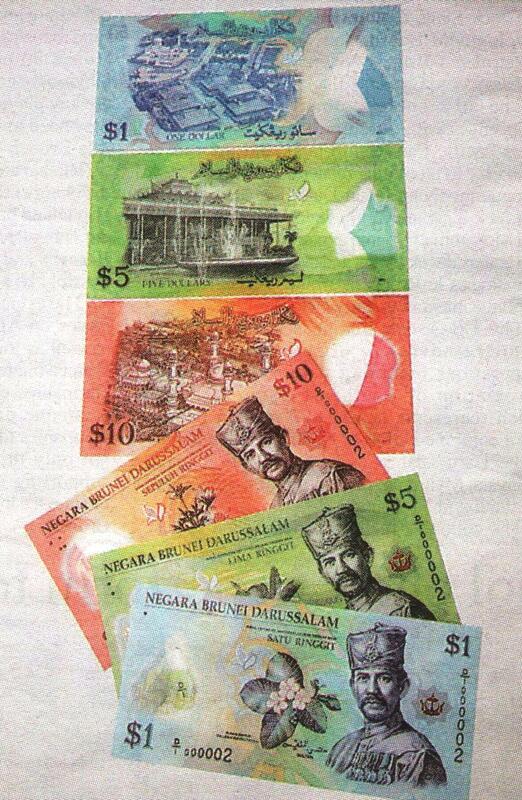 The $10 note also lost its keladi plant and this is replaced by the rancah-rancah. 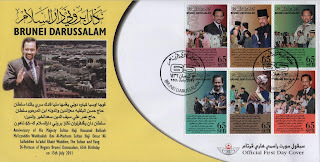 The reverse now depicts the Al-Jame Asr Mosque. BRUNEIANS can now get their hands on the new $1, $5 and $10 polymer banknotes when they will be made available and circulated this week. 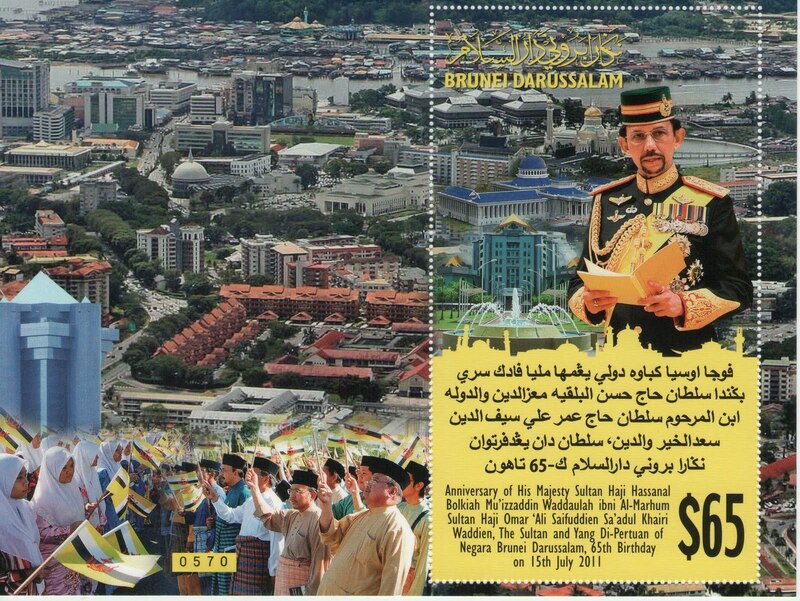 The new banknotes were issued by the Autoriti Monetari Brunei Darussalam (AMBD) yesterday to mark the 65th birthday of His Majesty the Sultan and Yang Di-Pertuan of Brunei Darussalam. Hj Adi Marhain Hj Leman, assistant managing director, AMBD Monetary Operations Department, said that the issuance of the new polymer notes introduces eight "new and advanced security features" to combat counterfeits and will be circulated side by side the present notes, which all will remain legal tender in Brunei and in countries which accept them. 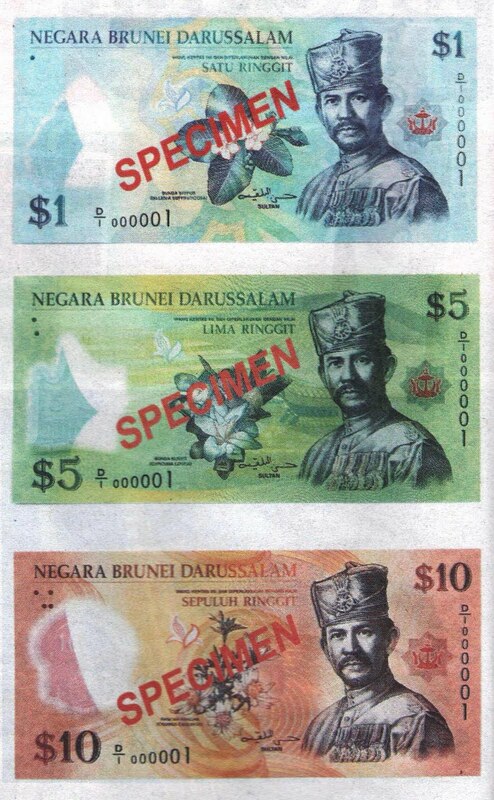 The new polymer notes contain a dynamic optical feature which alternates between gold and blue when viewed at varying angles, as well as a multicolour raised fine line printing of His Majesty's portait, Red Crest of Brunei Darussalam, the flower design and surrounding text. Raised printing of the Braille '1', '5' and '10' numerals are also introduced to aid the visually impaired. The Sultan Omar Ali Saifuddien mosque and the ceremonial barge, the Royal Ceremonial Hall (Lapau), and the Jame' Asr Hassanil Bolkiah form the complex clear window design on the $1, $5 and $10 notes respectively, each incorporating a shadow image and vignette of the corresponding numeral. When raised to the light, His Majesty's portrait, initials 'HB' and a section of the mosque or Lapau design will appear, along with a flower design through a combination of front and back printing in registration. 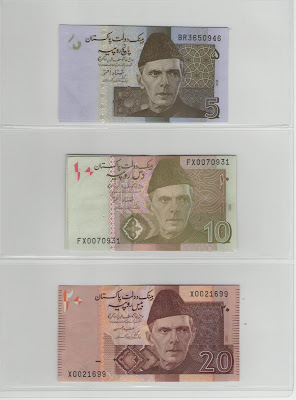 The new banknotes also feature complex fine line background security patterns in multiple rainbow print with fluorescing elements illuminate under ultra violet light. Serial numbers are printed in varying sizes and fluoresce yellow/green under ultra violet light. 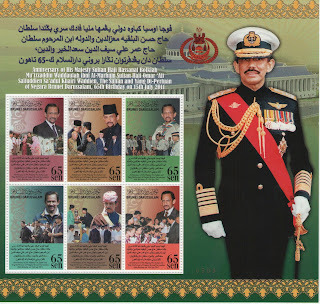 It's His Majesty The Sultan and Yang Di-Pertuan of Brunei Darussalam's 65th Birthday today. And what better way to celebrate the 65th birthday? 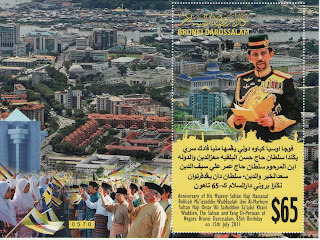 Yes, a $65 miniature sheet which consisted of the highest ever face value for a Brunei stamp - $65! 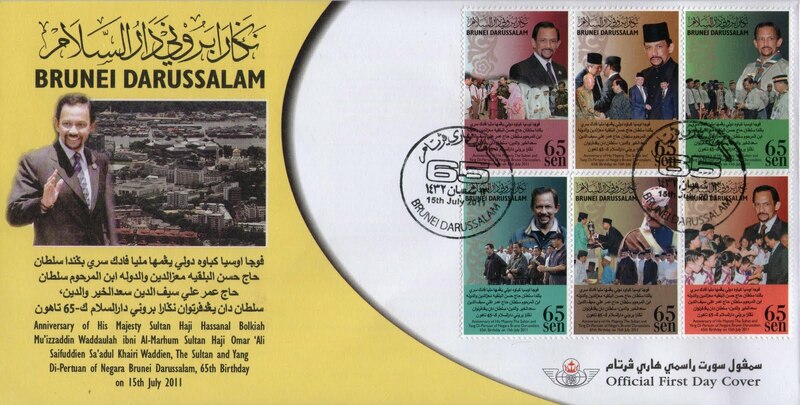 Size wise, the $65 stamp itself is probably the biggest size stamp that has been produced by Brunei. 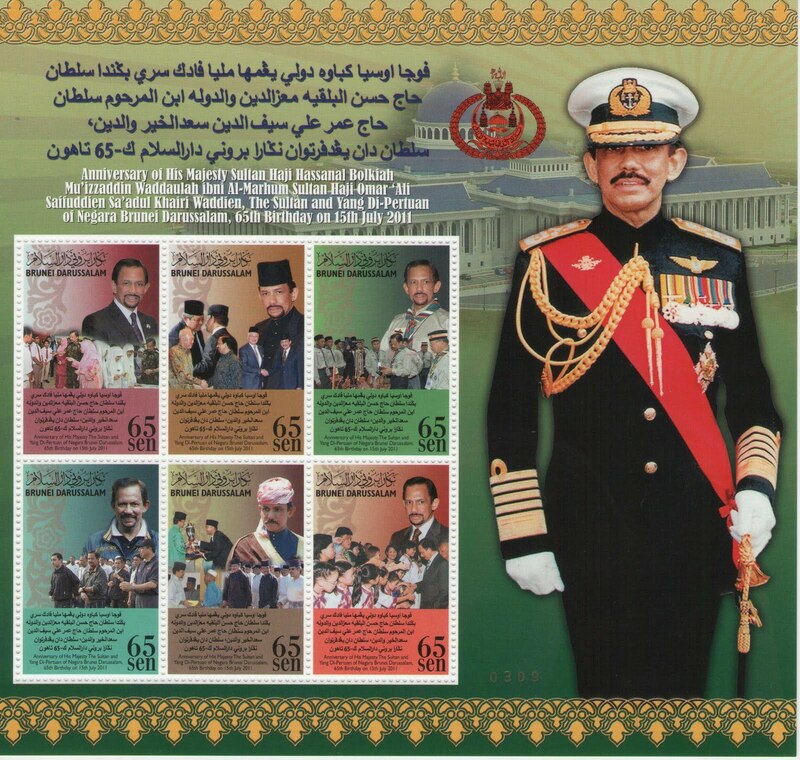 In its 116 year of history, the Brunei postal authorities highest value stamp before this was a $60 stamp which was in commemoration of His Majesty's 60th Birthday. That has now been superseded. However it has to be noted that the 50th Birthday Miniature Sheet had 5 $50 stamp making that worth $250, thus making that the highest value for a miniature sheet. If you can't afford the $65 stamp, don't worry. The postal authorities have the much cheaper miniature sheet containing all 6 of 65 cents each stamp. Or you can always get the first day cover with all 6 of the 65 cents stamps. I was in Islamabad in December to attend a meeting. The last time I was in Islamabad was way back in 1997. I realised that a lot has changed. The public places where in those days I could travel to are now closed to traffic. The most important thing for visitors to this blog is that the money has changed. Here are the obverse of the notes being issued nowadays. Note that the 20 Rupees have been replaced. According to the people I spoke to, the old 20 Rupees looked like the 5000 Rupees and hence the confusion. 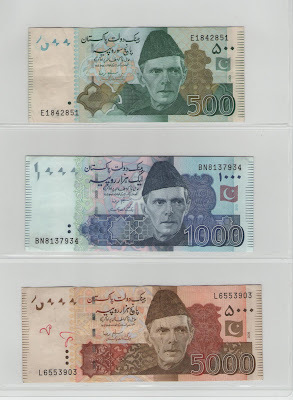 I thought the old 20 Rupees is much smaller than the 5000 Rupees and it is quite hard to think that these were alike. 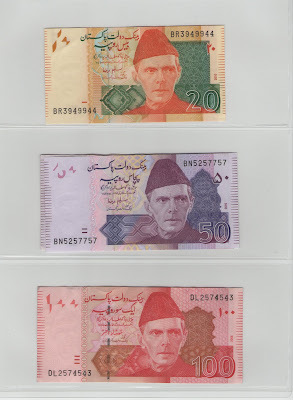 Anyway, the new 20 Rupees were much more colourful. 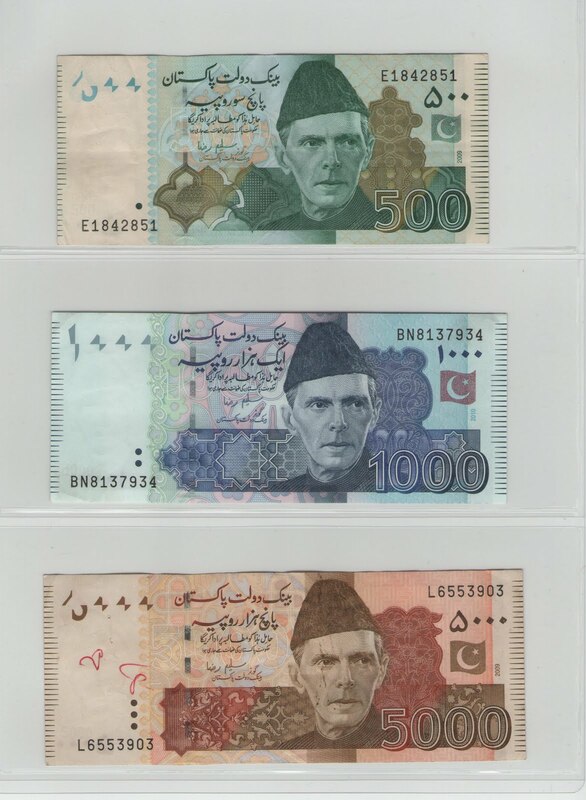 The Pakistani Rupees start from 5 Rupees and goes all the way to 5000 Rupees.